Welcome back to Something About Coins! There's been a lot of talk recently about dollar coins, so here are several articles covering them. The first one is a rant about their inconvenience, and the second one puts a whole new spin on anti-counterfeit coins. There is a true supporter of the dollar coin, discussed in the third article, and the effort being made by the Mint to promote them is in the fourth. A story about an error dollar and finally striking the coins wrap up today's post. 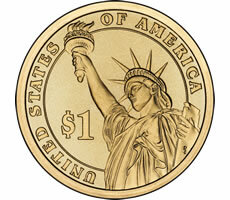 The next U.S. dollar to hit the streets will be the James Buchanan $1 coins on August 19. It will be the third new Presidential dollar coin this year, and the fifteenth coin in the series.